Pinhead, nerd, encyclopedia, and … geek? In fourth grade that’s an insult. Now it’s increasingly used as a compliment in various media. 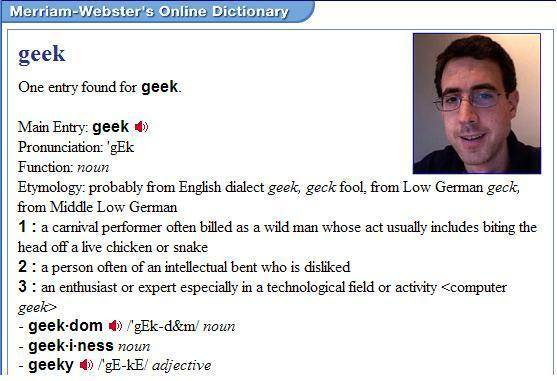 By the way, did you know a technologically savvy person isn’t the first definition given on Merriam-Webster? And you must have heard by now of the “Geek Auction” at Washington State University, in which the resident computer club members (apparently all men) have decided that auctioning themselves to a sorority is a good way to recruit women to their club and get dates. As for whether I consider myself a geek, I actually aspire to geekiness, or as I would call it, geekdom (that sounds more dignified, IMO). Call me a geek-in-training. Just not a pinhead.